The Hyundai Kona Electric is that brand's highly anticipated all-electric crossover. It's got a lot going for it as it slots perfectly into the market's hottest segment and coming, as it will, with a 64 kWh battery rated for 470 km (292 miles) under the WLTP cycle. It also looks pretty fine. The one driving review we've shared with you so far, using a prototype on German roads, had mixed results. On one hand, it featured a nice supple drive about town, but then seemed to fall down a bit when driven more aggressively. Now, as reports of the production version finding its way to South Korean customers reach the InsideEVs Forum, we're more than just a little curious how things have improved. For example, in that previously mentioned review, the driver found the go pedal to be "tricky to modulate when using Sport driving mode." While we can't say to what extent this issue has been addressed, we do have evidence of how the car seems to handle now when driven in anger. Nestled in the hills of Inje county in South Korea lies an interesting little racetrack with perhaps the best name ever for such a facility: the Inje Speedium. It's here that at least one Kona Electric has been put to the test, as you can observe in the video below. Not bad, right? Pushed hard in the many tight turns of this circuit, the battery-powered Kona corners pretty flat with a bit of understeer. The driver, who we believe to be Alex Lee (at least, that's the name of the YouTube channel featuring these videos), even manages a sweet four-wheel drift through one of the more sweeping turns. Here's another view from inside the cabin. Unfortunately, other than the video itself, there's no commentary from the driver on his impressions. 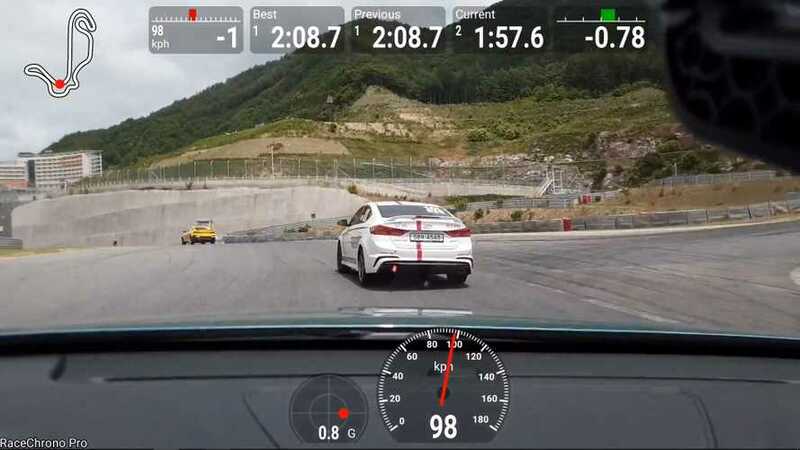 We do know that the car managed a best lap of 2:07:83 on the 3.908km (2.428-mile) track while riding on Hankook Rs3 225-45-17 tires that had 60 percent of their original tread remaining. We also know that we'd really like to visit the Speedium for ourselves one day, as it looks like a lot of fun in a beautiful setting.